Pour a tablespoon of avocado oil, or your favorite cooking oil in a cast iron skillet. Pour the soy sauce, ketchup, and honey into a bowl and 2 tablespoons of crushed red pepper and combine. Place the cast iron skillet on a medium- high burner, add the thighs and begin to cook it. Watch the thighs and turn as each piece cooks. Cook 5-8 minutes on each side. Remove the thighs. Slowly add the prepared veggies. Sautee them and season them with sea salt. Dip each chicken thigh into the sauce and make sure to cover each side. 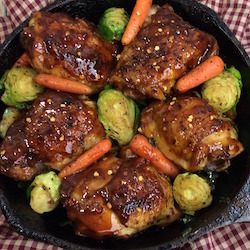 Return the thighs to the skillet to warm. Reduce the heat to medium and let simmer for 10 minutes.